It is very possible that you will be faced with unexpected emergencies – both natural and man-made. Are you ready? Statistics say that in the next 30 years, California is 99% likely to have an earthquake of 6.7 or greater. That is the magnitude equal to the Northridge quake in 1994 which damaged more than 40,000 buildings. Ask several dry cleaners in Santa Rosa who lost their businesses to the fire. One dry cleaner also lost his home as well. Not to mention all the customers’ homes that burned to the ground. The aftermath of the fires resulted in floods and mud slides. These things do happen and how quickly you get back in business depends on how prepared you are. Amtrust North America states research shows that ONE IN FOUR small businesses that close due to a disaster will NEVER reopen. “Most surveys just cover the first two years after a disaster and some businesses that do hang on only last two to five years before they give up.” This is very scary information. That is why it is so important to be prepared. First, you need a plan. The plan should be saved on premise and off premise. It needs to be looked at and updated periodically. And most important, shared with employees. If you do not have one, it is simple to start. Ask yourself the question – what if? You need to identify the risk and what action should be taken. For example, what should be done if the electricity fails? Should you stay open? Shelter in place with the doors locked? In today’s world, everything is run electronically. Cash registers, conveyors, etc. It would be difficult to conduct business but you need to decide how you want it handled. 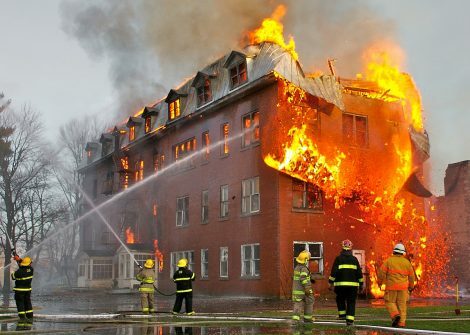 Or if a fire started in your shopping center, how do you want your business handled? These are just a few examples. Only you can identify the “what if” of your business. Once you identify the risks, then you should put them in order of likelihood of it occurring. Tornados and hurricanes are not much of a threat to California but are huge threats to other parts of the country. Part of your plan should list emergency phone numbers of key people/organizations: Fire Department, Police Department, insurance agent, landlord and contractor for your equipment, electrician, plumber. These numbers need to be readily available at your business as well as off site. Not on a note pad somewhere or a napkin tucked away. Have supplies on hand in your emergency kit. First aid kit, water, flashlights with extra batteries, whistles to signal if necessary. A crank-powered radio, hand tools and plastic tarps. Some other useful supplies should include heavy duty extension cords. In addition, you need to plan several escape routes away from your business- by car and by foot. You will not know what roads are passable or if emergency personnel will have the roads blocked off. Make certain your address is on your building and entrances and exits are clearly marked. Most important. Review your insurance coverage with your agent. Most insurance policies DO NOT cover earthquake. Coverage can be obtained by a separate policy. Flood coverage is tricky. Depending on the cause of the flood, rising waters, it is probably not covered under your insurance policy. Again, a separate policy can be purchased for this coverage. Fire is covered under almost all business owner policies. However, there is probably a waiting period before loss of income coverage becomes available. This waiting period can be anywhere from 24 -72 hours. You need to know this information in order to make affective decisions about your business. These are just some guidelines to help you start your planning. To help identify natural hazards that may affect your business location, go online to www.disastersafety.org. There are many other sites to visit including www.redcross.com.